1862-63 Chalon Issue on Pelure Paper, Imperforate, Unwmkd. 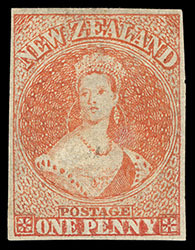 New Zealand, 1863 Queen Victoria "Chalon Head", 1d orange vermilion on pelure paper, imperf, unwatermarked, o.g., unusually large margins all around, brilliant rich color, minute brushed over thin spot, choice Extremely Fine appearance, DuBois (Hiroaki Inoue), Matthew Bennett, May 2007, lot 2224; with 1998 R.P.S.N.Z. certificate. Scott No. 21. Campbell Paterson No. A1g $25,000 ($17,100). SG No. 81 £12,000 ($15,770). A MAJOR CHALON HEAD RARITY WITH ONLY SEVEN RECORDED UNUSED EXAMPLES, THIS BEING ONE OF THE FINEST KNOWN. As an indication of rarity, the 1d orange vermilion on pelure paper (SG 81) has been absent from such major collections as Hind, Caspary, Dale-Lichtenstein, "Chalon" and Bartrop. The Hackmey collection contained two unused examples without gum. The original gum example offered here is an outstanding rarity. 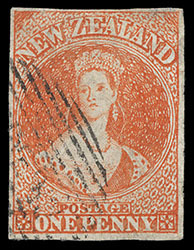 New Zealand, 1863 Queen Victoria "Chalon Head", 1d orange vermilion on pelure paper, imperf, unwatermarked, cancelled by Dunedin barred oval, full to large margins, intense radiant color on bright paper, couple small thin spots at top, remarkably fresh and Extremely Fine appearance with outstanding eye appeal. Scott No. 21. Campbell Paterson No. A1g. SG No. 81 £2,500 ($3,280). New Zealand, 1863 Queen Victoria "Chalon Head", 1d orange vermilion on pelure paper, imperf, unwatermarked, horizontal pair, "Dunedin" postmark in 15 bar oval, large margins all around except touched at bottom right corner, beautiful radiant color, cancelled by sharp strikes of "Dunedin" 15-bar oval, unnoticeable light vertical crease in left stamp, particularly fresh and Extremely Fine appearance; with 2001 B.P.A. certificate. Scott No. 21. Campbell Paterson No. A1g. SG No. 81 £5,000 as singles ($6,570). 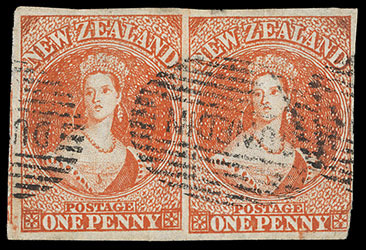 A REMARKABLE RARE USED PAIR OF THE 1863 1D ORANGE VERMILION ON PELURE PAPER. 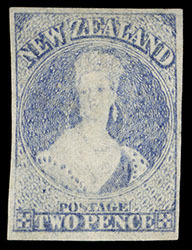 New Zealand, 1862 Queen Victoria "Chalon Head", 2d ultramarine on pelure paper, imperf, unwatermarked, unused without gum, large margins all around, beautiful delicate color, filled thin spot, fresh and Very Fine appearance, an outstanding example of this rare unused stamp. Scott No. 22c. Campbell Paterson No. A2f (1). SG No. 82 £6,500 ($8,540). 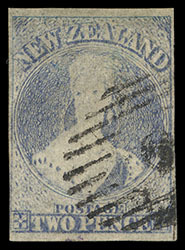 New Zealand, 1862 Queen Victoria "Chalon Head", 2d ultramarine on pelure paper, imperf, unwatermarked, full to large margins, strong color and impression for this difficult stamp, cancelled by slightly indistinct numeral barred oval, Very Fine and rare sound used example. Scott No. 22c. Campbell Paterson No. A2f (1). SG No. 82 £850 ($1,120). 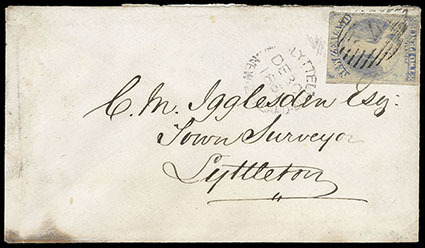 New Zealand, 1862 Queen Victoria "Chalon Head", 2d ultramarine on pelure paper, imperf, unwatermarked, large to huge margins except clear at top, tied by numeral "7" barred oval, matching "Wellington, New-Zealand, DE 29, 1862" cds backstamp on cover to Lytteton, Dec. 30th arrival cds; stain at bottom left, F.-V.F. and rare use; signed Holcombe. Scott No. 22c. Campbell Paterson No. A2f (1). SG No. 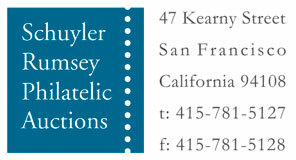 82 Estimate $750 - 1,000. 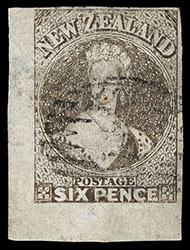 New Zealand, 1862 Queen Victoria "Chalon Head", 6d black brown on pelure paper, imperf, unwatermarked, unused without gum, four large even margins, rich color with a sharp impression; small faults including two tears at bottom, Very Fine appearance, a scarce unused stamp, Philippe Ferrary, Broquelet and Gilbert, Sale X, June 1924, lot 391. Scott No. 24. Campbell Paterson No. A5d. SG No. 85 £3,500 ($4,600). 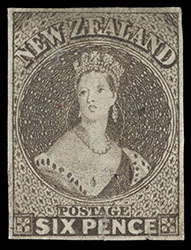 New Zealand, 1862 Queen Victoria "Chalon Head", 6d black brown on pelure paper, imperf, unwatermarked, corner margin single (R. 20/1), huge margins at left and bottom, full to large at top and right, bright color, cancelled by indistinct numeral barred oval; tiny tone speck in chin and couple small thins, otherwise Very Fine and rare corner margin single, Joseph Hackmey, Spink Shreves, May 2010, as part of lot 2280. Scott No. 24. Campbell Paterson No. A5d. SG No. 85 £250 ($330). 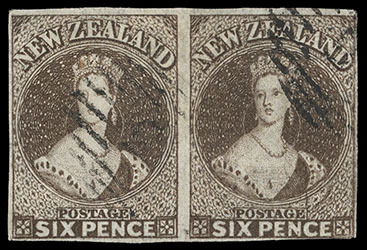 New Zealand, 1862 Queen Victoria "Chalon Head", 6d black brown on pelure paper, imperf, unwatermarked, horizontal pair (R. 16/2-3), Position R. 16/3 showing re-entry, full to large margins except just touched bottom right corner, deep rich color and strong impression, each cancelled by barred oval, right stamp with small corner crease and scissor cut, left with tiny tone speck in crown, Very Fine appearance, a rare pair with plate re-entry variety. Scott No. 24, 24 var. Campbell Paterson No. A5d (Z). SG No. 85, 85 var. £500 + as singles ($660).